TOKYO — It’s not often that a major art museum hosts an exhibition for a poet. More typically, an archive will organize such an event. But if the poet is also a visual artist and collaborates with musicians, then a museum might open its doors. Such is the case at the National Museum of Modern Art, Tokyo, which is hosting The Voice Between: The Art and Poetry of Yoshimasu Gozo. Gozo, whose book of poems Alice Iris Red Horse is forthcoming from New Directions in September, was born in 1939 in Tokyo and began elementary school on August 15, 1945, the day the Emperor went on the radio and announced the end of the war. Apart from brief stretches in Wakayama, his father’s hometown, Gozo grew up in western Tokyo. After studying Japanese literature at Keio University, Gozo published his first book, Shuppatsu (Departure) in 1964. That same year, Gozo attended a performance of Twenty Questions to Bob Rauschenberg at the Sogetsu Art Center in Tokyo’s Akasaka district. The conflict over the Japan‐U.S. Security Treaty was raging, and that cast a long shadow over my student years. Of course, the sixties were a time of Americanization in Japan, and there was wave after wave of cultural influence: in literature there were the Beats, and in music there were folk singers like Bob Dylan and Joan Baez, who were followed a bit later by the Beatles. Jazz also played a large role in Gozo’s development as an artist. By 1968, Gozo was collaborating with musicians at the Pit Inn in the Shinjuku section of Tokyo. He has referred to this era as a “liberated area” because of “the lack of barriers” between the arts. The Voice Between celebrates a similar lack of boundaries. For someone who’s not seen Gozo perform before, the sanukite can be a bit bewildering, but there’s a straightforward explanation. In the late 1970s, Gozo had grown weary of Tokyo’s art scene and, as he recounted in an interview first published in 2007 and reprinted in the exhibition catalogue, he made his way to the Shimokita peninsula, in the far north of Honshu, to visit Mount Osore. According to Buddhist belief, this mountain marks the entrance to hell. While there Gozo sat with an itako, a blind female shaman who can communicate with the dead. He couldn’t understand her Tōhoku dialect, but he was inspired by her use of prayer beads, made of shells and twigs, as she invoked the gods. In the interview, he said, “If you asked me what I absorbed from my encounter with the itako in Mount Osore, I’d say I tried to re-enact the instruments, sounds, and the air that they created. That realization came thirty, forty years after my pilgrimage.” He merged that practice with Toru Takemitsu’s use of sanukite stones for the music in Masaki Kobayashi’s film Kwaidan, an anthology of Japanese ghost stories. When I discovered Gozo’s appropriation of itako practices, I bristled. The itako tradition dates to the Edo period (1603-1868) when women needed to contribute to family wages. At the time, this occupation was one of the few open to blind women. Blindness, in Japan, has a long association with spiritual powers. By the Meiji period (1868-1912), itako practices were outlawed. According to Martin Fackler in The New York Times, many Japanese today look down on the few remaining itako, believing that they simply promote superstition. Surely, Gozo is aware of this, which caused me to wonder if he’s simply appropriating some of the itako’s marginalized practices because it aligns with his desire to be seen as avant-garde. As an able-bodied Japanese man, he has the privilege of taking what he wants from the itako. Or, perhaps Gozo is playing the role of ethnographer and has an interest in the evolving history of this tradition. The itako should similarly be freed from Gozo’s actions. Even though it seems at times that his fans approach him with an air of deification, Gozo doesn’t claim to be a shaman. 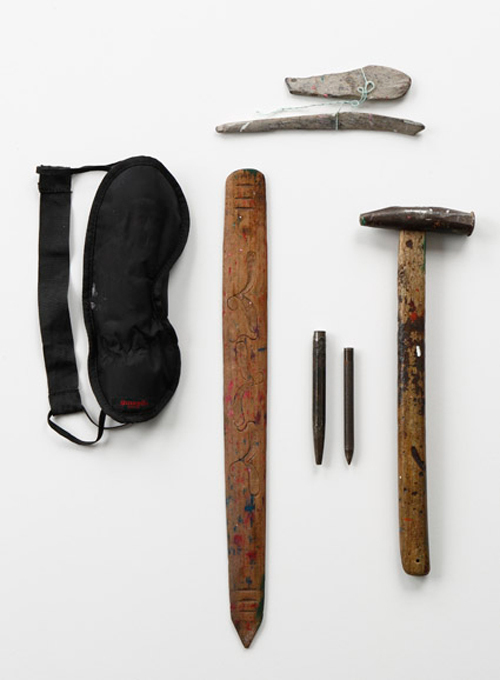 In his hands, shamanistic tools are part of a performance, rather than a ritual or ceremony. In the interview with Onda he remarked that, “I’ve been wounded by comments that compared me to a shaman and so forth, but that was really just ‘tears of ignorance’ on my part.” This comment and others that Gozo has made convey his skepticism of the shamanistic tradition. In contrast, Cage was never skeptical of Zen tradition. 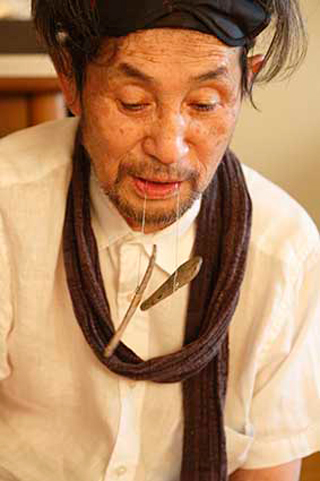 He didn’t see it as “fishy,” which is one way that Gozo has described itako ritual. After the performance, I walked across the lobby and entered the large exhibition room where the curator, Kenjiro Hosaka, had arranged a display of notebooks, video work, works on paper, a large selection of cassette tapes, and some photographs. The room is low-lit and partitioned with thin black curtains, a layout that doesn’t force a visitor in any particular direction. 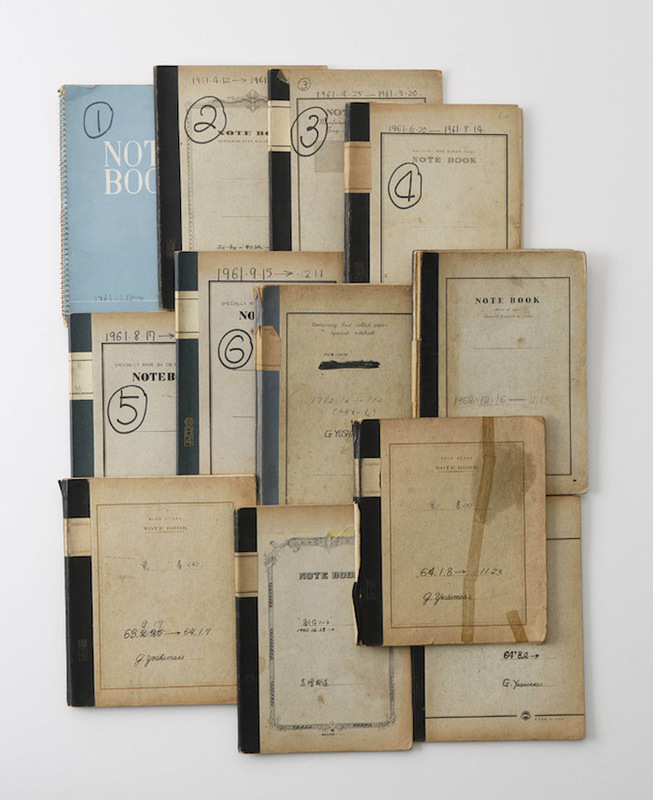 The notebooks, which consist of diaries and memos, date from 1961 to 2012. They are simply arranged in glass display cases and striking to see lined up next to one another. The older ones are common Japanese composition notebooks. The more recent ones are Moleskines. As the catalogue points out, Gozo, “maniacal about documentation,” will paste letters and faxes into his notebooks and indicate “Dry Days” when he hasn’t touched any alcohol. I place great value on tape recordings, and I record and carry with me the great voices of other people, that I may absorb them. I love my Walkman, it’s even changed how I perceive sounds. Now I am accompanied on my walks by readings from Yeats, Tagore, and Celan. As I listen to them, I vocalize so that they listen to me too. He’s skeptical of the memorization that singers must do because, in his view, that brings all creativity to a stop. 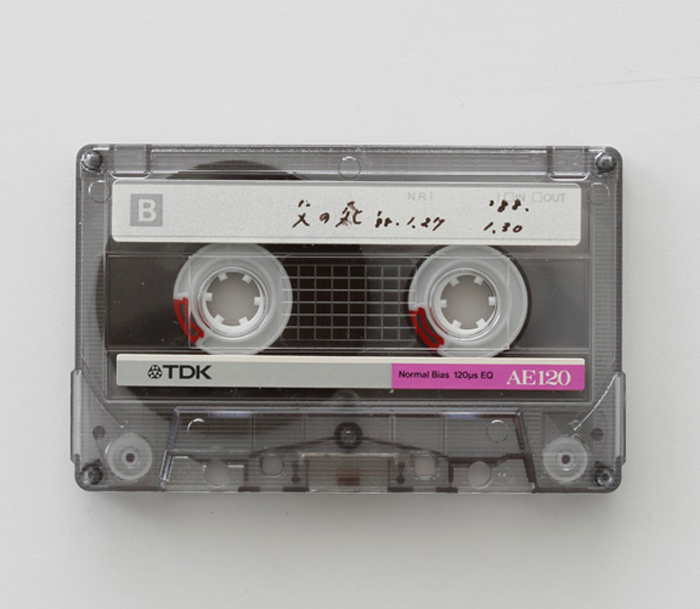 As he put it, “[The song or poem] needs to be smashed to bits in order for you to create something new.” His practice of repeatedly listening to tapes of others and himself enables him to embody what has been disembodied. This, in its way, seems a spiritual process: finding the human voice that’s stored in a machine. Much to my surprise, I was most struck by the exhibition’s section of photographs, especially Gozo’s use of double-exposure techniques to create sedimentary layers, or tectonic plates, of mostly quotidian images. A few were titled after Emily Dickinson poems, such as “I went to Heaven, ‘Twas a small town.” The photos seem to mimic the layering of one’s conscious and subconscious minds – one experience on top of another and then fading out. The “Voice Notebooks” are similar in this regard, because each tape represents a different form of consciousness. It’s possible to play one tape and understand it, just as it’s possible to single out one layer of imagery in these photos, but if you were to play all the tapes at the same time, consciousness would become blurry. And yet, as I see it, Gozo’s work is also “just art,” in much the same way Cage described Dada from the perspective of the early sixties. This doesn’t mean that Gozo’s work or that Dada is beside the point, just the opposite. Apart from the uninitiated or the truly conservative, Gozo’s work is not going to feel new to anyone anymore. It currently stands as an exemplar of what can happen when disciplines are freed from constrictions, and the questions his work raises about the relationship between spiritualism and art, as well as the use of non-traditional tools in the creative process, will always be relevant. If his work represents the poetry at “the root of all performing arts” from the 1960s to where we are now, what will that poetry sound like in a hundred years, when the itako could be non-existent and, instead of sanukite, a performer might use tantalum, one of the minerals found in an iPhone, to produce non-traditional percussive sounds? The Voice Between: The Art and Poetry of Yoshimasu Gozo continues at the National Museum of Modern Art, Tokyo (3-1 Kitanomaru-koen, Chiyoda-ku, Tokyo) thorough August 7.